Live Over Freak Valley was recorded during Mothership’s joint tour with fellow Texan riffsters – Wo Fat on the Texas Takeover European Tour. Freak Valley Festival was one of the destinations the tour hit. Wo Fat released their excellent live album from Freak Valley earlier this year with Live JuJu. Now it’s Mothership to join the party with their performance. So is it any good…. Well if you’re a fan of Live Albums and Mothership this is a must-have album. Mothership play a mixture of old songs from their first album – ‘I’ and new songs from at the time their soon to be released new album – ‘II’. The album opens with – Hallucination – from their debut album. It’s a great song to open the album with as Mothership lay down their trademark fast-paced riffs with a few spaced out noises to get the enthusiastic crowd in the mood. 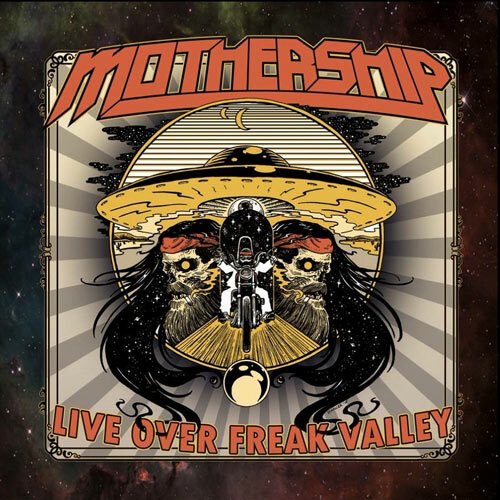 Live Over Freak Valley proves Mothership were born to perform on the stage as they’ve created an electrifying live album that can be ranked alongside with Wo Fat’s Live JuJu as one of the best live albums of the year.